In the next few weeks, our lives will move more towards indoor activities as daylight lessens and temperatures fall. Families will transition to the indoors to watch football, eat comfort food, and sit in front of the fire. The kids will be home from college on the weekends, and company will be visiting for holidays. You can use this next week or two to get your house clean and ready for the coming seasonal activities. Windows: Wash interior and exterior windows to clean fingerprints and bacteria inside, and leftover pollen and dirt outside. Do this on a cloudy day so streaks are more visible. * While you’re working on windows, check indoor caulking around window edges and doors. Whether you like it or not, you will eventually have to turn the heat on, and you want to keep it in your house. Which also means you should dust and vacuum baseboards and heating ducts so you don’t blow warm residue in to your home. Blinds: Now that your windows are sparkling, you should vacuum canvas and fabric blinds with a brush attachment on a lower setting. Vinyl blinds can be wiped down with a damp cloth. Don’t forget to dust valances and frames. Bedding: Do you like the idea of a cozy, warm bed? It’s time to take your flannel sheets, comforters and duvets out of storage and put them through the laundry before you make your bed with them. Don’t forget to wash your mattress pads as well. *This is also a great time to turn your mattress. Rugs:If you want family and guests to leave there shoes and boots at the door, tempt them with an obvious place to leave them, and super clean rugs. Schedule a professional carpet cleaning appointment while temperatures are cool and humidity is minimal. This will make for quick and complete drying. The Fridge: Move your refrigerator out of its space and clean behind it. We know it’s dark back there, but that’s why it’s a great place for mold and bacteria to grow. Don’t forget to vacuum the condenser coils to remove dust and allow for efficient performance. Lighting: as days grow shorter, you will want to maximize your indoor light sources, so clean any mounted ceiling light fixtures. Remove and wash light bowls from the fixtures. Wood floors: evaluate hardwood floors for wear and tear and scratches. This is the perfect time to have them deep cleaned and waxed to protect them from the upcoming weather and all the stuff that winter boots will drag in. 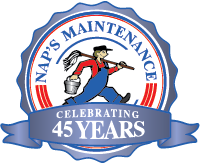 NAPs Maintenance provides housecleaning, window cleaning, and cleaning for hardwood floors and carpets, as well as in-house upholstery cleaning to help get you ready for the Fall and Winter months. You can contact us to discuss how we can help with your cleaning needs.